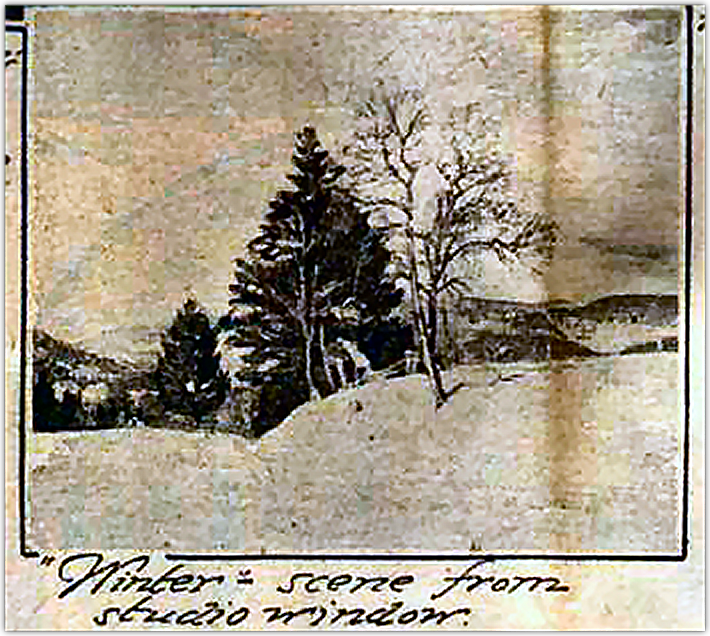 RSW- Artwork page, "Winter: Scene from the studio window"
This painting is one of 4, versions of what we are now calling the "Winter: From the Studio Series." There is a Scrapbook story devoted to Woodward's possible mistake in his artwork diary that has caused us a great deal of fits and confusion. 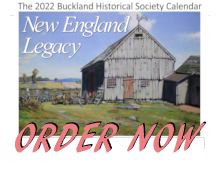 For more about the Hiram Woodward House & Studio, see our Scrapbook page. 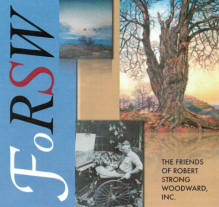 Read these Scrapbook stories for more about RSW's Studios. "Painted prior to 1928. A canvas of the winter view of mountain, slope and group of trees (dominated by a tall winter cherry tree) across the road from my 2nd studio that burned. Bought around 1927-8 by Mr. E. B. Robinette of Chestnut Hill, Philadelphia, and now owned by his widow. Mr. Robinette was a very distinguished man, a close friend of Herbert Hoover and his head secretary during Mr. Hoover's First World War Relief Project"
"Mrs. E. B. Robinette, 12 East Chestnut Hill, Philadelphia, PA, owns a 25 x 30 winter view from my north window at the old place (Hiram Woodward studio) which burned." This piece was exhibited at the 1928 J. H. Miller Co. Galleries Exhibition along with 37 other paintings and chalk drawings. This painting appears in Woodward's diary simply titled "Winter." Woodward did not start compiling his painting diaries until the early 40s and so much of it was done from memory. What is not clear to us is if he used other references to help him. As great a resource the diary is, it is equally inconsistent and greatly lacking. 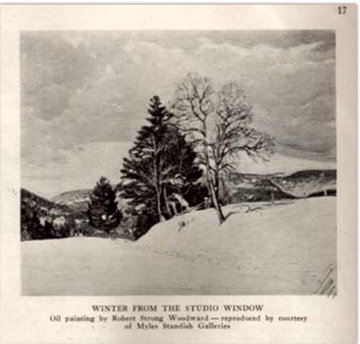 This is an excellent example, there are three other versions of this wintry scene, two of which exhibited in 1931 and 1933 respectively and yet there is no mention of them in Woodward's diary. 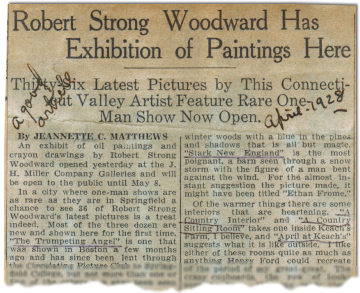 This was not uncommon for Woodward to not make mention of later versions of original paintings. We do not know why he chose to do this. 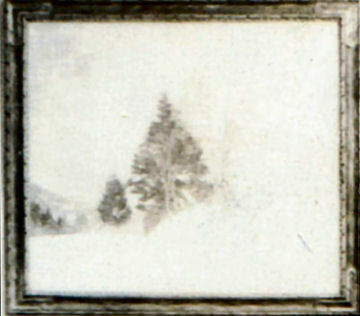 Below Left: Is a scan of Winter From The Studio Window from what is believed to be an invitation and Below Right: Is reportedly a picture of the painting taken before it was hung at an exhibition.